The building reflects Soviet Era hospitality and construction. The large structure was once considered futuristic and a shining triumph of Communism. 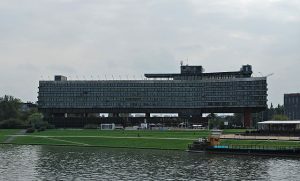 The hotel was one of the most modern buildings in Krakow in 1989 when it finally opened. It was big and was openly derided for its size. And that it looks like cinder blocks on top of Lincoln logs. Today it is used as large billboard but the ground floor is where a trendy bar is located. The exhibition also documents the stories of a group of passengers with Polish names such as Ostrowska, Paw?owski and Paw?owicz. The victims of the tragedy included a Polish Roman Catholic priest named Józef Montwi? ?, who was traveling to the United States to take over a parish in the state of Massachusetts. He is said to have refused a place on a lifeboat. The exhibition runs from 9 Feb 2018- 1 Jun 2018. Information and details at https://www.wystawatitanic.pl/. Average attendance per exhibition day fell by 9.4% to 462 compared to same quarter last year with 510. They had more exhibition days during the quarter compared to last year. Some costs went down due to lower compensation costs. Our top-line performance reflects weaker demand for Titanic and Bodies in established venues such as Las Vegas and Orlando, lower average ticket prices across all semi-permanent locations, along with fewer of our domestic touring partnered exhibitions achieving profit share participation. These factors led to admission and merchandise sales declines that were only partially offset by higher license fees for rented exhibitions touring internationally. The year over year decrease in total revenues, coupled with rising exhibition costs, yielded a reduction in adjusted EBITDA and a net loss for the Company during the three-month period. The nugget here is a new appraisal is being undertaken but not just of the Titanic artifacts but the intellectual property developed as part of this collection. That tells me they are trying to sweeten the pot. They will not only get the entire Titanic collection but all the other proprietary materials as well. It also makes sense if you are asking big money people to pony up millions of dollars. 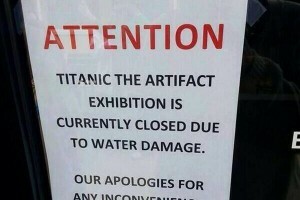 Yesterday I noted that there was chatter on the Internet about a Titanic exhibition that was shut down by water damage. A sign was posted saying the exhibit was closed but failed to disclose the location. I have yet to see a full picture that shows not only the door it was on but can show exactly what building it is attached to. I have seen one picture, actually one that seems to accompany the water sign, that seems to indicate it might be the Luxor Las Vegas. 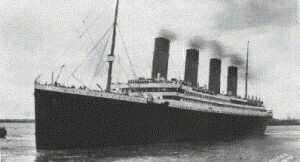 Right now Titanic:The Artifact Exhibition is there and the picture also just catches the name Bodies. Bodies, another Premiere exhibition, is also at the Luxor as well. Earlier speculation is that it was either in Belfast or England. However it seems they are just relying on Tweets and blog postings. I have yet to see any concrete proof that the Titanic exhibit in Las Vegas has been shut down. I took a look at the Luxor site and then clicked on the purchase tickets section. That connects to Ticketmaster which shows tickets available for the Titanic exhibit 7 November on. There is no notice of closure. I looked at the official Luxor tweets and found no mention of the exhibit being closed either. Now if someone out there can state exactly the date, time and place this occurred, please drop me a note here at Titanic News Channel. I suspect this is looking to be a gag since we cannot seem to find hard evidence this actually occurred. I will update when I have more information. Titanic:The Artifact Exhibition will be at the South Florida Science Center and Aquarium starting 16 November and runs to 20 April 2014. Tickets: $15 adults/$11.50 for kids 3-13/$13.50 seniors (62+). Hours: Monday-Friday 9:00 a.m. to 5:00 p.m.; weekends 10:00 a.m. to 6:00 p.m. Admission includes Titanic exhibit and admission to rest of Science center. Further information is at sfsciencecenter.org.